Which way are the Eagles headed (for now), Carson? Playoff chances: 57.7 percent. Carson Wentz's QBR has risen in each of his four starts, culminating in a career-high 95.9 QBR in the Eagles' Thursday night win over the Giants. Wentz is averaging a career-high 39.5 pass attempts per game and might need to continue carrying the load with Jay Ajayi out for the season and Darren Sproles out since Week 1. #JimmySays: The guess here is that the Eagles will indeed add a running back, but I don't think it'll be a big name guy. You would never know it if you didn't glance at the numbers, but Carson Wentz is off to a better start in 2018 than he was in 2017. Perhaps it's the lack of a running game for most of the season that has led to the dysfunction on offense, or the poor record prior to "Thursday Night Football" against the Giants. 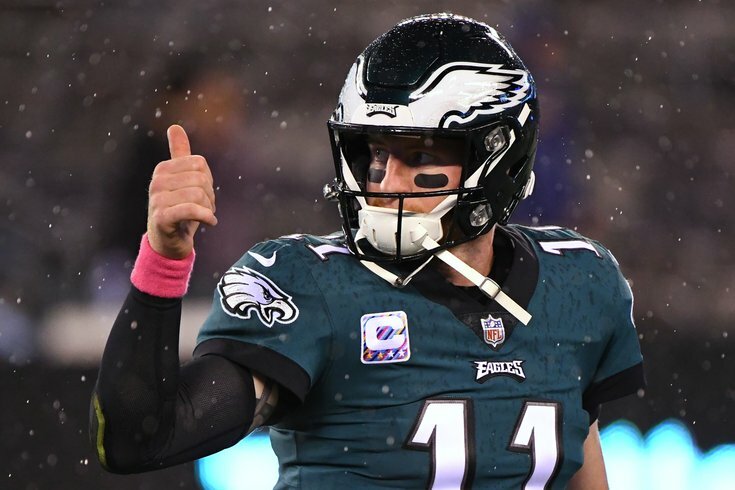 Wentz's completion percentage through four games is up compared to his numbers through four last season (68.4 from 60.5), as is his yards-per-game mark (298.0 from 264.5) and TD-to-INT ratio (8:1 from 6:2). As encouraging as that might be, more encouraging is the fact that Alshon Jeffery got involved in a big way versus the Giants. With Jay Ajayi down and defenses honed in on Zach Ertz, Doug Pedersen needs Jeffery to have a big year. #JimmySays: Wentz had indeed been very good so far this season, despite an offensive line that has not played up to expectations, and a depleted receiving corps early in the season. The best thing going for the Eagles is that the rest of the NFC East isn’t scary. Philadelphia looked last Thursday night like they’re ready to make a run. #JimmySays: The best thing they have going for them is Carson Wentz. And then the crappy NFC East. Doesn't Corey Clement, coming off 10 days to rest his healing quad, deserve chance to be lead back? Don't forget what he did in Super Bowl. #JimmySays: He's clearly the best running back they have, in my opinion. Angelo Cataldi: The champion Eagles are back, for now at least... What took so long? The team we saw against the Giants was the team we expected to see this season. They seem to be ready to roll now. #JimmySays: 13th? Lol. They're behind the Miami Dolphins here. Carson Wentz, Alshon Jeffery, Corey Clement and Zach Ertz, all healthy together, have the offense looking as explosive as it was in 2017. Now the defense needs to keep masking the secondary to lead to more dominant victories. #JimmySays: Well, I wouldn't go quite that far after one win over the garbage Giants. The 2017 offense was special. The 2018 offense has had one good game. The defending champs got well Thursday night against the Giants, and they play two of their next three games at home against the Panthers and Cowboys and meet the Jaguars in London in between. Will the Eagles make an effort to trade for Le’Veon Bell? They could offer one of their two second-round picks in next year’s draft. #JimmySays: I wouldn't trade a 2 for a one-year rental. Yes, yes, I know, 3rd round comp pick and whatnot. It's not that simple.